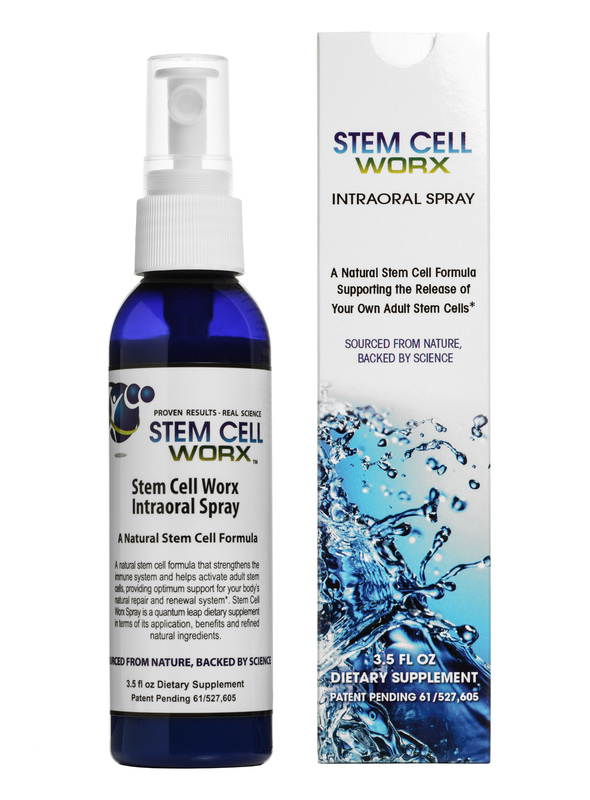 Stem Cell Worx Intraoral Spray is a natural health supplement that aligns with today's new science. This product is manufactured in the U.S.A. by a leading, long established FDA Inspected Laboratory that is GMP certified for liquid supplements and is a member of The Natural Products Association. Scientists have now proven - it is fact - the more adult stem cells we have circulating in our body, the healthier and stronger we are to fight off disease and the aging process. As we age our body's ability to renew and repair tissues declines rapidly. The process of cellular regeneration is essential to helping you maintain optimal health and well-being. 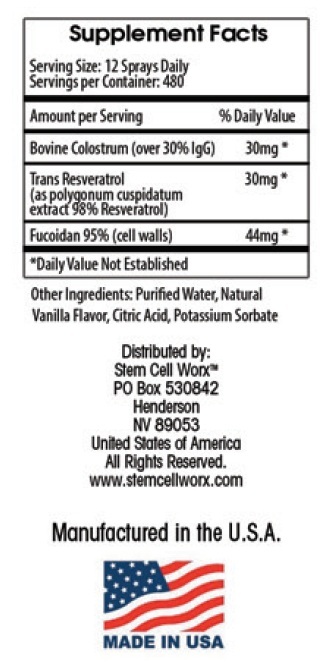 The combination of these key ingredients and Stem Cell Worx's unique delivery system is what makes this supplement so effective. The bovine colostrum in this dietary supplement contains more than 21 times the immune factors of human colostrum. The bovine colostrum is collected from pasture fed cows and has a guaranteed time frame for collection, that is always within 12 hours of the cows calving. It is always GMO-Free. The cows are hormone-treatment free, antibiotic-free and BSE free. The activation of adult stem cells occurs due to the synergistic effect of Stem Cell Worx's maximum immune and protein factors, immunoglobulins, peptides and cytokines. Combined with a pure 98%-99% trans-resveratrol (that supports the enrichment of Mesenchymal stem cells) and a pure 95% Fucoidan (that increases the expression of CXCR4 on human CD34+ cells) is what makes this supplement so effective. No other stem cell supplement in the market has the pure, natural immune factors and high grade protein that are absolutely necessary to initiate the activation process of one's own adult stem cells. All product claims are backed by independent clinical studies on humans. This supplement is also a rich source of magnesium, iron and zinc along with important vitamins such as Vitamin A, B1, B2, B12 and Vitamin C.
It is scientifically proven that the most effective way to take nutrients, to ensure you get maximum absorption, is orally (sprayed under the tongue, hold for 5-10 seconds, then swallow). Intraoral (also referred to as sublingual) is a viable solution offering an absorption rate of up to 95% of its nutrients compared to just 10% - 20% absorption that capsules and tablets provide. This is because the sub-mucosal membrane (that sits under the tongue) enables nutrients to get directly into the bloodstream, straight away. The Stem Cell Worx Intraoral Spray is taken sublingually. Spray under your tongue, hold for 5-10 seconds, then swallow. The standard recommended daily dose for adults is 12 sprays a day (6 in the morning; 6 in the evening). Best taken on an empty stomach (approximately 30 minutes either side of eating). Take the formulation consistently every day as recommended for 40 days. Each bottle contains a 40 day supply, based on 12 sprays a day. The sprayer is powerful therefore in order to get the correct dosage from each spray, push the sprayer down gently then release, approximately quarter of an inch. The sprayer is not designed to be pushed all the way down. Keep away from heat and do not store in direct sunlight. In hot climates (above 86 Fahrenheit, 30 degrees Celsius) best stored in the refrigerator. CAUTION: Do not take if pregnant or expecting to get pregnant. Children under 18, and individuals with a known medical condition should consult a Physician before using this dietary supplement. If you are underweight, are prone to getting an upset stomach or have recently had a major illness or health set back that you are recovering from, it is recommended you start with just 3 sprays in the morning and 3 sprays in the late afternoon and slowly build up the number of sprays over a two week period. By supplementing our nutritional needs throughout our adult lives, we can enjoy increased health and longevity.